It's me again! I discovered that you can get a beautiful effect by layering Shimmerz paints over acrylic paint. For this layout I started with a Fancy Pants chipboard sheet. I removed the chipboard shapes and used the negative space. First I used a sponge to dab on acrylic paint. Just before the acrylic paint was dry, I sponged on two colors of Shimmerz paint. 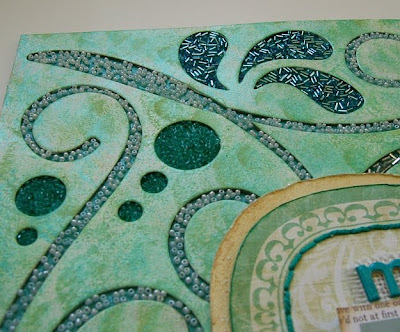 I used Tickle-Me-Turquoise and Jilted Jade from the new summer release. 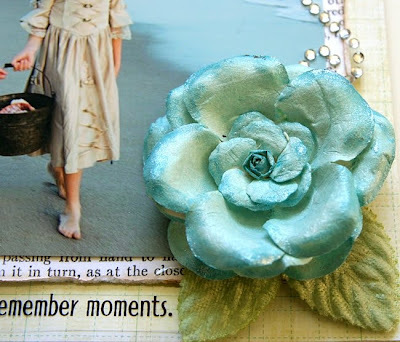 And at the bottom of this layout is the white Prima flower I dyed with Shimmerz Spritz and paint (see my last blog post). You always have the most unique, SUPER COOL ideas! LOVE this, Stacy!!! that it such a sweet pic of your giirls! love this! Breathtakingly beautiful! So, so elegant. And those girls. . .UGH. . .gorgeous!